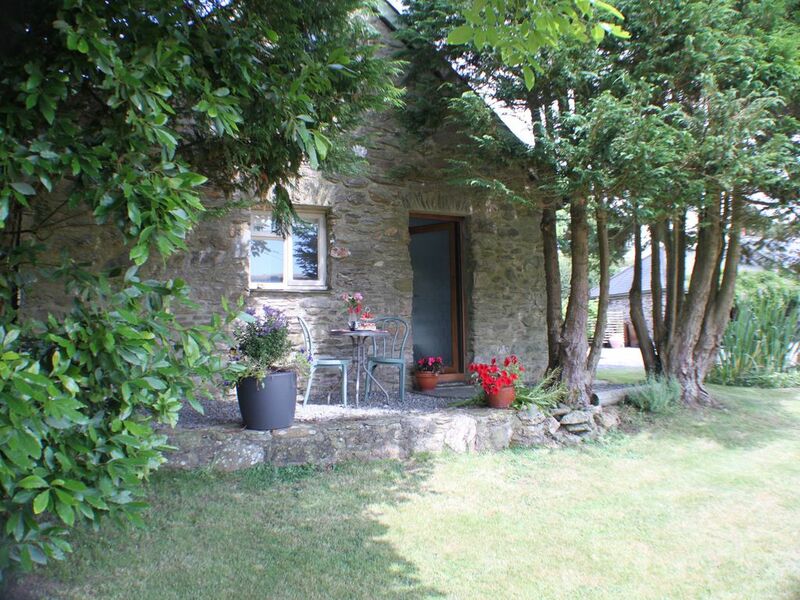 This studio is located in a converted barn complex in a peaceful haven within the South Hams up a single track road. It is surrounded by the local beaches and the beautiful Salcombe estuary. A perfect retreat for those who want a peaceful escape with the idyllic coastal and countryside walking, or for just lazing on the local beaches. The studio also offers the local nature reserve of Slapton Ley with its vast lake and reed beds makes for beautiful walks and bird watching. The studio has its own privacy when sitting outside overlooking the rolling hills and you can often see deer in the hills opposite. Buzzards and rooks chasing each other off and lots of swallows darting in and out. The night sky is beautiful as there is no light pollution and all our guests remark on how beautiful the stars look and they are often found sitting on the decking with a glass of wine star gazing. Inside the Studio you enter downstairs into the small kitchen and towards the left of the kitchen is the toilet and shower room. Upstairs is one long living area with window over looking the rolling hills, where a table is set to enjoy your meals with a view. A chesterfield suite set infront of the TV with a coffee table housing a choice of dvds. Plenty of chests of drawers and cupboards. Electric heating and a big double bed. The property also has off road parking. We were born in the home counties and moved to Devon in 1977 the year we got married and moved to Dartmouth, our favourite place.Friendly owners, we are always at hand with helpful advice of local knowledge, restaurants, beaches and activities. We fell in love with this place and area over 30 years ago. The property looks down the valley and over open countryside. It is surrounded by beaches, an estuary and rivers, and it is only 40 minutes to Dartmoor. Great coastal and country walks and nice country pubs serving local produce. We love the location and is so peaceful and we love watching the wildlife from our garden. Downstairs bathroom with shower, WC and sink. Open plan living area, with chesterfield suite. TV with Freeview and DVD player. Small kitchen with electric hob (2 rings),no cooker or stove on the ground floor. Has sink, fridge and microwave. Outside table and chairs. Thurlestone Golf Club, 10 miles. Dartmouth Golf and Country Club. 10 miles Bigbury Golf Club 13 miles. Notes on accommodation: The studio is no smoking and we do not accept pets. There is no oven or stove but has 2 electric hobs and microwave oven. Recyling bins are provided in the dustbin area in garden. Outside: Small garden area with outside table and chairs, garden table and 2 chairs and decking area. Shared parking is available in garden next to decking area. Cleaning / Towels / Linen / Maid service: Towels and bedding are provided for the duration of your stay. Although Studio is self catering some items are provided as a starter help ie. toilet roll, dish cloth, bin liner and some washing up liquid. More suited to younger couples.very tiny kitchen area. Myself & my partner had a wonderful time at the studio on Cousins farm,for us this was the perfect location to visit all the little villages & resorts close by,but also the perfect place to spend the day on the farm as it was very peaceful & tranquil,this was just what we both needed,also the owners Shirley & Terry made us feel very welcome it was like we had been going to the farm for years,hopefully we will be returning in the near future. If you go often to this part of the world you will know the insanity that is Salcombe,and the drabness of parts of Kingsbridge. What people come here for is the countryside and the cliff-top walks and and this is right in its heart. It is close to the best pub in the world, the Millbrook Inn, and the view from the front door alone is breathtaking. Shirley and Terry amazing hosts. Sooo friendly and helpful. If we had known about the cottage at the same place, we would have booked this instead of the studio. Would have loved to be in this. The studio is ok to be used as a base, bit like staying in a bed sit. Was cosy and clean. Shirley had left us strawberries and a bottle of drink to welcome us . Facilities quite basic, although we did manage once we had got ourselves organised. We had taken a vegetable steamer and mini oven so was able to cook some very basic meals. Would have been better if there was something to put over the sink to create some working space in the kitchen area such as a large chopping board as there is no space at all to prepare food. We would definitely recommend staying in Shirley and Terri's accommodation. Shirley made us very welcome. Cream tea on arrival was a nice touch. We would recommend to other couples without hesitation. There is often a walking group/tour of Slapton Ley and Village, details of times and days can be found in Torcross Post Office at Slapton Sands. Beautiful walks can be reached 30 minutes from Studio along coastal paths towards Start Point Lighthouse to the right which lead down into beautiful coves for that picnic or to the left of the path towards Beesands and Hallsand and Torcross easy cliff paths leading to beaches with local Pubs and local caught fish. Unique shops in Dartmouth, pretty cobbled stone streets with cafes and restaurants catering for all tastes. From Dartmouth a boat trip up the river Dart is beautiful with on board refreshments, or you can take a Steam Train trip along the estuary through Kingswear forest to Totnes. A walk along Dartmouth embankment towards Bayards Cove to the Old Keep which looks out to sea the the two Castles either side of the Dartmouth Estuary. Hallsands and Beesands shingle beaches 2 miles.Torcross and Slapton sands, tides change beach from shingle to sand, has lovely walks along the Lee leading to Slapton Village. Towards Start Point lighthouse which you can visit (2 miles from property) in a turning off towards Llannacombe Bay which is unspoilled and has a sandy beach, rock pools and shallow water warmed from the sun on the sand. From Millbay's sandy beach 5 miles a passenger ferry can be caught to Salcombe. Torcross/Slapton sands one and half miles and Bantham with its sand dunes and is is reknown for surfing 11 miles then there is Hope Cove 10 miles with its old world charm of thatched cottages, rock pools and the Anchor Inn Pub. Nearest Airport, Exeter, 43 miles. Nearest train station, Totnes, 163miles. Nearest Ferry port, Plymouth, 25 miles. Nearest Town with supermarkets and shops, Kingsbridge7 miles. Nearest shopping mall, Plymouth, 25 miles. Nearest pub, The Millbrook Inn South Pool 1.5 miles, also a great walk. Woodlands Family Theme Park, 8 miles, a great family day out. Paignton Zoo, 22 miles. Plymouth Aquarium 25 miles. local private run gym Energize Gym 3 miles in Chillington. Doctors 3 miles Chilllington.Tesco supermarket Kingsbridge 5 miles. Local Garage with large store Ashbys Easy Store in Charleton 4 miles. Stokely Barton Farm Shop Torcross 1 1/2 miles. Booking Notes: £60 deposit required on booking, full payment 21 days before guest arrival. If booking within 21 days of stay, full payment required on booking. Payment can be by Bank Transfer or cheque. From 5 night stay the full week's rental is charged. Changeover Day: Changeover day is Friday from January 2014, but short breaks are available. Arrival 2pm. Departure 10am. Notes on prices: Short breaks are available, minimum 3 nights, please contact for pricing. From 5 nights full weeks rental charged. No short breaks in high season.